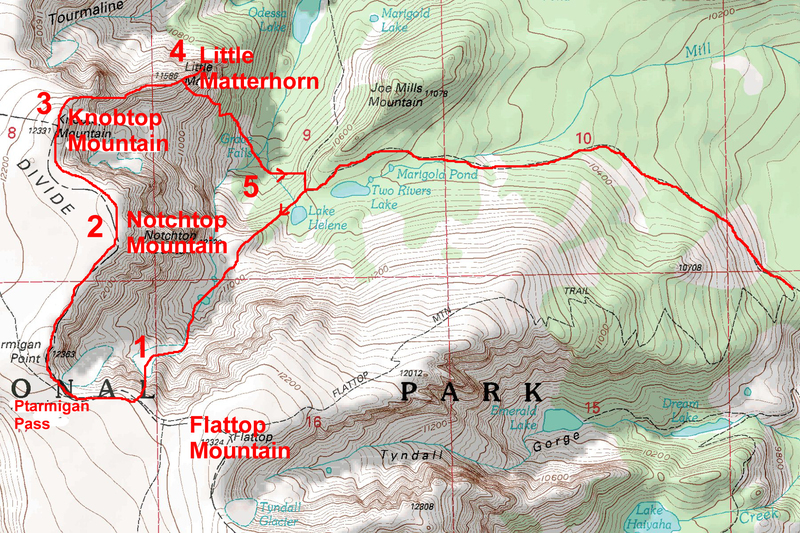 In writing this trip report, the initial title was “Escaping the slippery slope of incremental decision-making on a last minute hike up Flattop” but that didn’t really work for obvious reasons. I revised it to “The Slippery Slope of Flattop” but that also didn’t really work because it implied a trip report about slipping down a steep and/or icy mountain slope, which wasn’t true. Ultimately, I decided to go with the title you see above which accurately indicates the primary object of the trip, even if it doesn’t foreshadow any lessons learned. I hope that is alright. 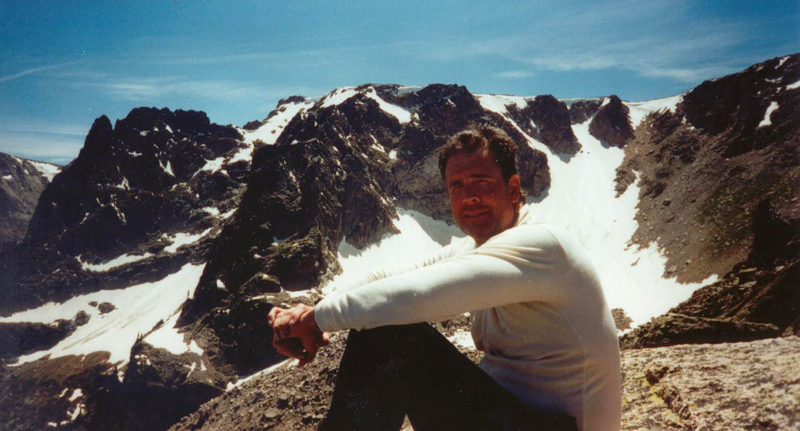 On July 29, 2000, my regular climbing partner, Brian, was sick and no one else was available for a last minute mountain adventure. To get some exercise, I had resigned myself to a Green Mountain linkup with other nearby peaks. My lack of enthusiasm kept me from getting a prompt start; it wasn’t until 1:30pm that I got myself ready to go. As I was leaving home, I happened to notice that my RMNP Annual Pass was expiring 2 days hence. In a spur of the moment reflex (I dare not call it a decision), I drove to RMNP with gear for Green Mountain. Naturally, the traffic and parking were horrific at the height of tourist season and so late in the day. But I was desperate and found the mental strength to push on. I parked in the Bear Lake parking lot and started hiking at 3pm. Wearing shorts and a tank top and without a hat or jacket, I didn’t expect to get far on my hike up Flattop. In fact, I would have been satisfied with a couple mile hike to treeline. I certainly started with the sense that the inevitable thunderstorms would chase me off. As you might guess, I’m a fan of the good-plan-ready-now instead of the perfect-plan-ready-tomorrow. But it turns out that it is also important to carefully distinguish between a good plan and a bad plan. It turns out that starting with a bad plan leads to spur of the moment changes to deal incrementally with problems and new ideas; and the new overall plan, as seen in hindsight, can end up making no sense at all. 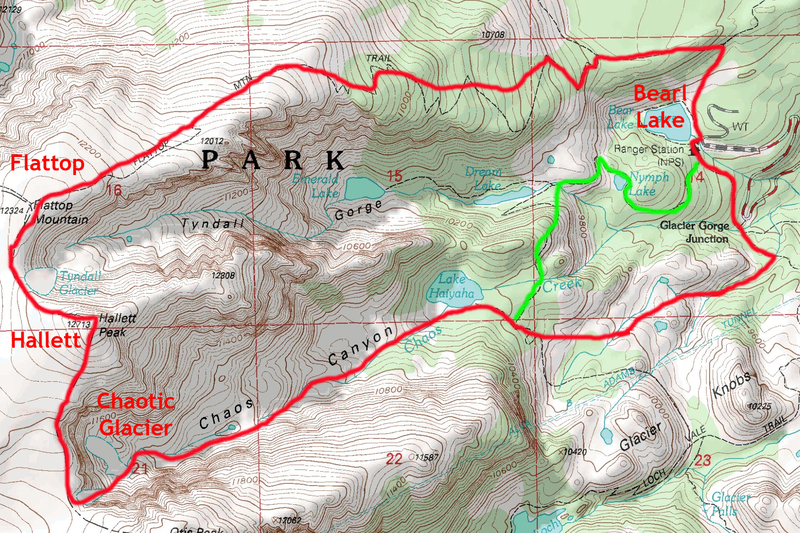 The standard route from Bear Lake to Flattop Mountain An 8 mile round trip gaining 2,800 feet in elevation. 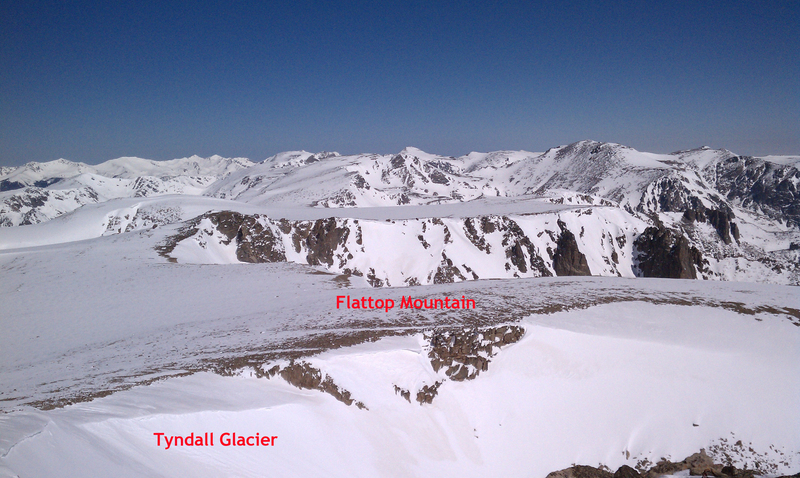 But, to my amazement, the clouds in distance stayed away all the way up to the broad flat summit of Flattop. Overjoyed with my good fortune, it occurred to me that it would be fun to finally bag Mt. Otis while I was there; I mean, it was just on the other side of Hallett, how long could it take? 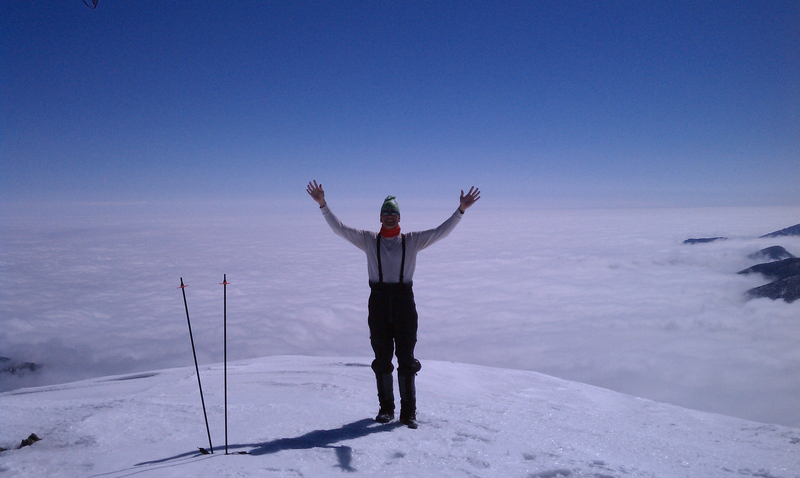 But when I looked to gauge the distance to Mt Otis, I couldn’t see it. And since I didn’t have a map, I figured the best thing was to start hiking towards Mt Otis until I could see it, so that’s what I did. 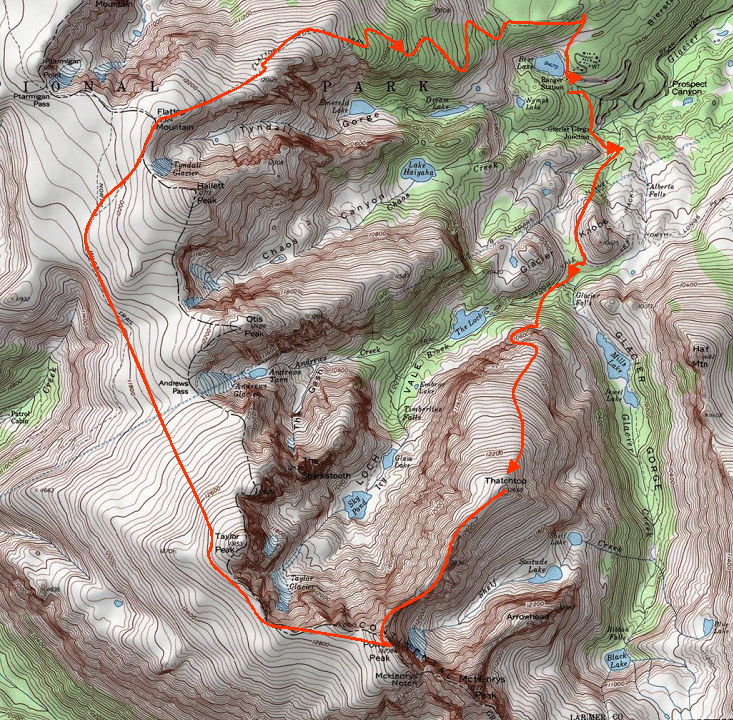 While I was moving, it occurred to me that it would be even more fun to also descend Andrews Glacier, since I’d be so close, and create a magnificent loop route. I reasoned that the extra distance couldn’t take too much longer than just heading back down the way I came up, and I would have salvaged the day with a great adventure. 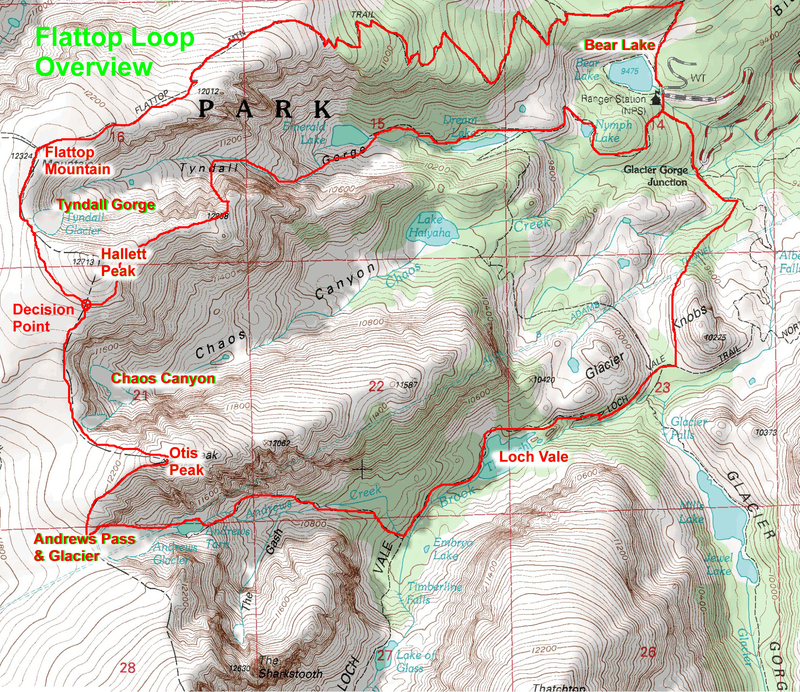 For a mountain adventure, I love a loop route. Compared to an out-and-back or “lollipop” route, a loop route means covering and navigating more new ground. Since the terrain never repeats, the risk of route-finding failure compounds until the final steps to safety are taken. In other words, in a loop route, there is always a chance of having to retrace the entire route until the final few steps. Uncertainty = Drama. Once I could finally see Mt Otis, I noticed that it was actually further away than I expected. Without much of a pause, I figured I had better hurry if I was going to make it to Otis and beyond before the storms came on. and I was essentially naked with no extra clothes in case I did become caught out in a storm or after dark or both. This was just too stupid, even for me. I backed-off. But I hadn’t completely lost my nerve. It occurred to me that there was another way that would be shorter than going back down the Flattop trail; and it would involve only a small gamble. 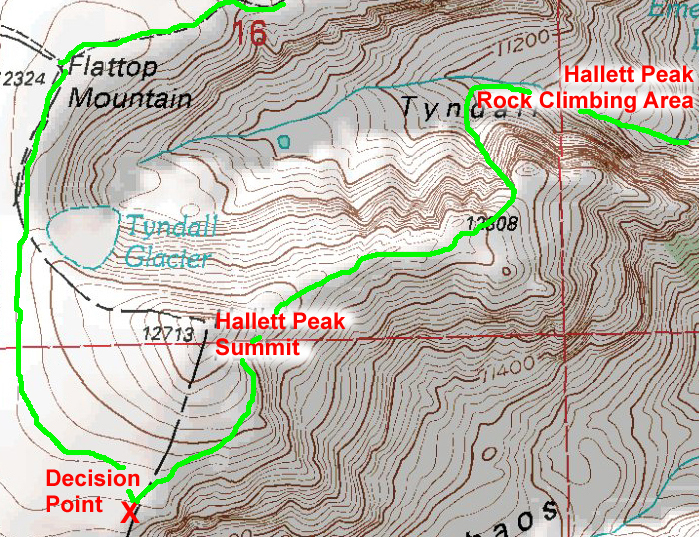 I decided to head northeast to find the Hallett Peak climber’s descent gully which I’ve used many times to descend into Tyndall Gorge for the hike back to Bear Lake, passing Emerald and Dream Lake along the way. 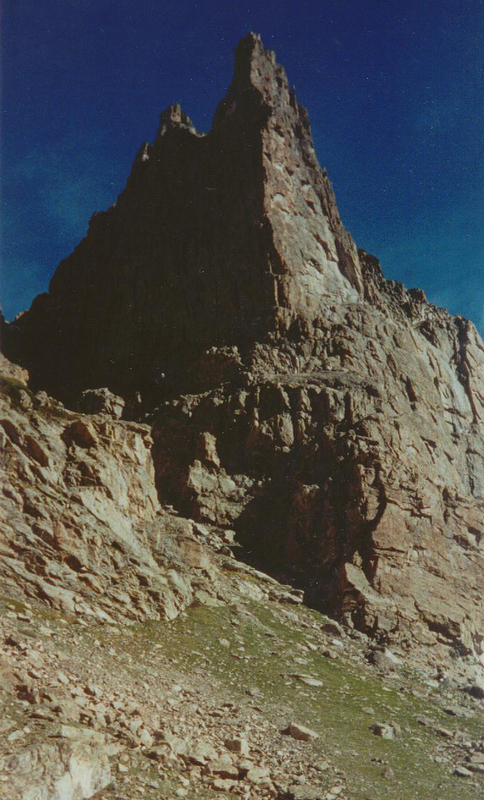 I just hoped that there were no impassible obstacles between me, standing near the top of Chaos canyon, and the climber’s descent of Hallett peak. I bet my life that there weren’t. 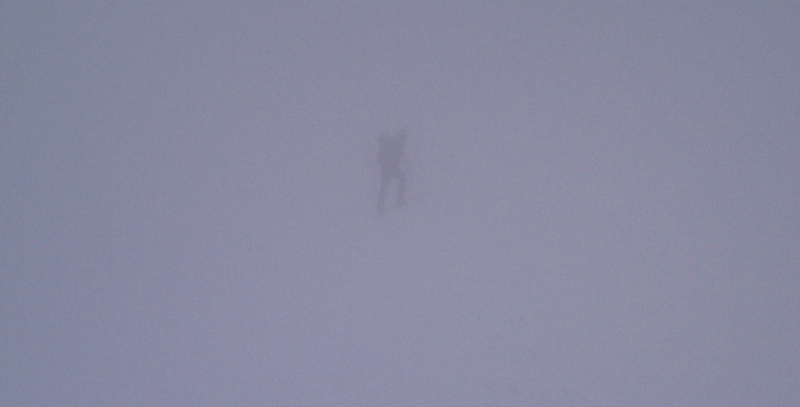 Rough route taken up Flattop and down Hallett. Note: photo from a different trip. 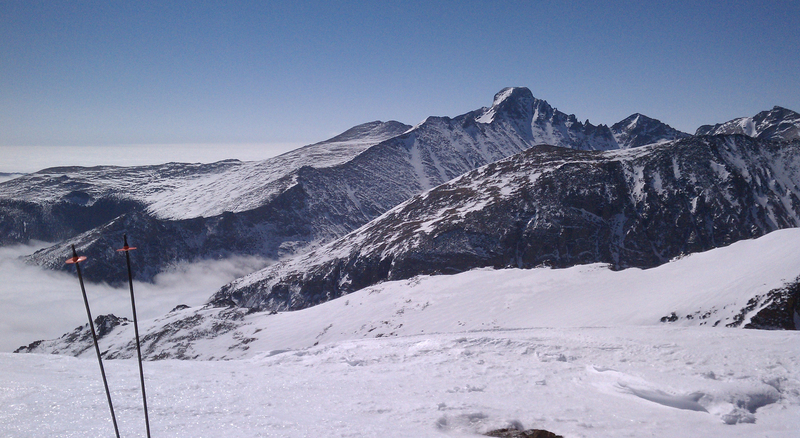 I started with a very fast pace and quickly found that the ridge from the summit down to the climbing area was unbroken. 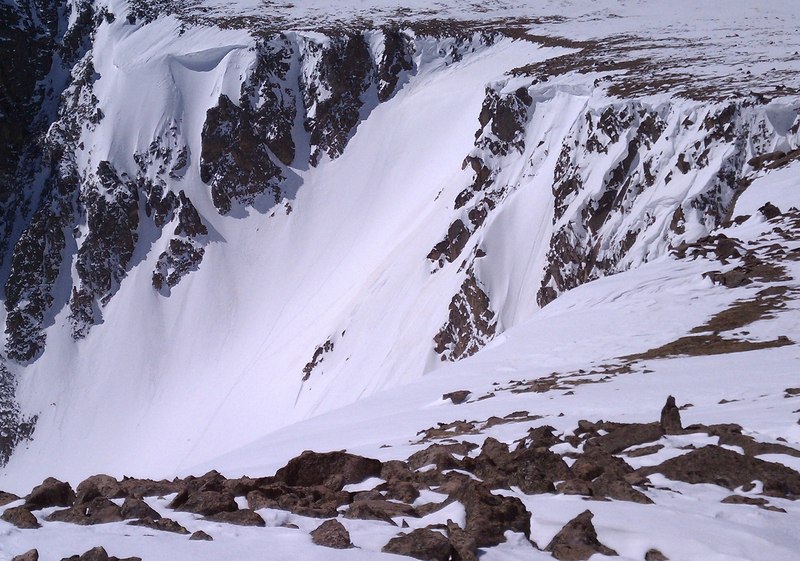 But I also found that finding the descent gully was hard coming from the “wrong” direction. Every gully started to look like the descent gully and I had to check out every one to avoid passing it by. But eventually I came to the right one; it looked just like all the other gullies except for a few details that I couldn’t remember until I saw them. It would have been impossible to figure out how to get down without direct, personal experience with the terrain. The descent gully is a loose mess, but it goes. And I was able to get my body, including a just recently functioning brain, down to the Tyndall Gorge in working order. Then I worked my way down past the climbing area which was devoid of climbers at that late hour. And straining to beat the sunset, I hurried down to Emerald Lake and reached the easy hiking trail with plenty of light left. I had the trail to myself as I made my way past Dream Lake and then Nymph Lake, and finally to the Bear Lake parking area. I reached my truck right at sunset for a 5 hour round trip. On this trip, my biggest danger was my own carelessness. But, hey, I got in one more Rocky Mountain National Park adventure before my pass expired. And I got a cheap reeducation on mountain sensibility.